Pine Mountain Lake Vacation Rental #4687 LakeHouseVacations.com Rent Me! "Hart Lake House" is a large lakefront cabin on a beautiful, wooded lot. SUPER AWESOME LOCATION! 500-feet to the popular Marina Beach! Dog Friendly! The owners welcome your furry family members! Maximum 2 dogs, max 100lbs. Dogs must be well-behaved, housebroken, non-destructive. Unsupervised pets must be crated. See pet rent in website fee description. 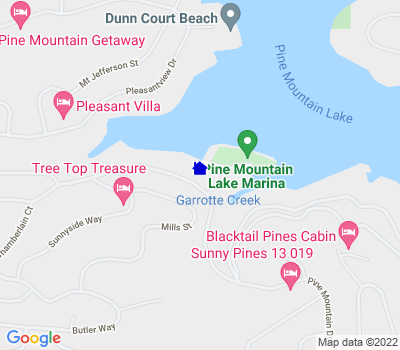 Pets are not allowed on Pine Mountain Lake beaches. Pets must be on a leash at all times within the gated resort community; Tuolumne County leash law. 500-feet to the popular Marina Beach! BBQ pits, picnic tables, expansive lawn and beach areas, designated swimming area, snack shack open all summer, bait shop, paddle boat, sailboat, kayak, standup paddle rentals. The main living area is the perfect place for you and your loved ones to enjoy hanging out together...the kitchen/dining/living/deck are all on the same level, providing spacious & expanded living. Vaulted pine ceilings, 4-bedrooms, 3-bathrooms, 2000sqft, 3-level, telephone, 2-televisions, 2-vcrs, 2-dvd players, basic cable, dvd movies, vhs videos, wifi, woodstove, central heat & air, microwave, dishwasher, washer/dryer, ping pong table, deck, deck furniture, charcoal bbq, gas bbq, private dock, paddle boat, canoe, 2-person kayak. Bed sizes: 1K, 1Q, 1-Bunk + 1T = 3 Twins (this bedroom is 7ft x 7.5ft), 1-Bunk + 1 Twin = 3 Twins (this bedroom is 7ft x 10ft). Sleeps 10, maximum occupancy 10 (including children & infants of any age). Dining table seats 9-10. Kitchen bar seats 6.
rent + tax + fees. This ad has been viewed 32505 times.